We do not normally show car or racing crashes but in this case are going to make an exception as fortunately no one was hurt. We were able to obtain a postcard that racing driver Tom Alley sent to his cousin after the race. 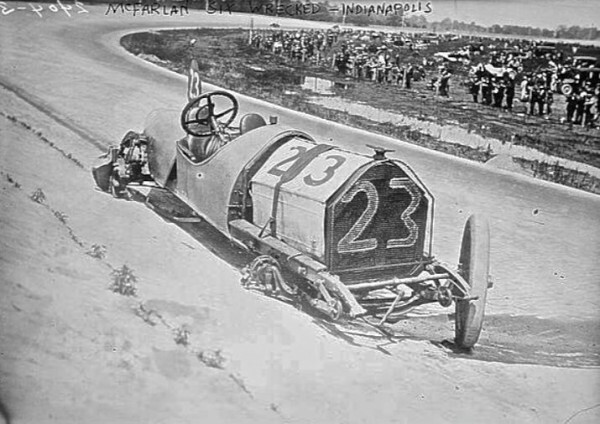 He told her how he faired when the “wheels caved in” on the McFarlan on the 64th lap. The car in the George Bain photo above is parked in the spot on the postcard that he marked with an X. 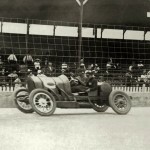 Alley was a relief driver in the race at the time for Mel Marquette. 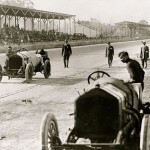 Ralph DePalma drove one of the most dominating races in history of the event after leading laps 3 to 196 and at that point he was leading by 5 1/2 laps at the time, when his Mercedes suffered a broken connecting rod, just 1 1/4 laps from the victory. Joe Dawson in his National went on to victory by leading just the last two laps, as DePalma and his riding mechanic, bravely got out of the car and pushed it down the entire length of the front-stretch. Photos of Dawson below and DePalma and his mechanic from the Peter Helck Collection, courtesy of Racemaker Press. This entry was posted in Auto Racing 1894 - 1942 and tagged 1912 Indy 500, Joe Dawson, Mercedes, National, Ralph DePalma, Tom Alley. Love it. 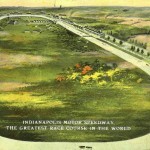 Here Indianapolis we have been celebrating the centennials involving the birth of the track and the Indianapolis 500 and things like this have been a real pleasure to see. Thanks. Greetings from Australia., I own the only Pan American known.. as you may know Tom was instremental in having Harry Miller build the OHC 4’s for the Pan Am.. as I understand from the general wishful thinking experts, the first 7 were thus equiped.. my car is # J-05… how it got here is anyones guess tho seeing we wound up with the ‘fake’ stock Hisparno that went against the STUTZ.. and a lot of others, anything could happen , and did.. I have collected a lot of Tom Alley ‘dope’ over the years… the card would have been nce…… during the ww11 the Miller engine was broken up for scrap, there has got to be one out there somewhere.. somewhere.. somewhere.. If all else fails I may fit an early OHC V8…. an keep hoping……….. .. Kind Regards.. John Ryder..
Hello! I just stumbled across your picture of the postcard from Tom Alley to his cousin in New York…Tom is my grandfather’s second cousin. How exciting is it to see a piece of family history….just wish the post card had stayed in the family! Thank you for sharing it though.